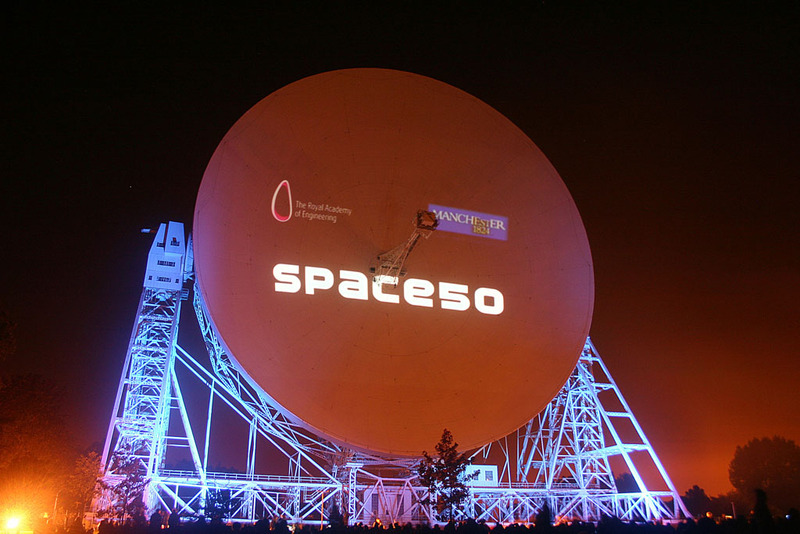 The space race is 50 years old and the Lovell Radio Telescope at Jodrell Bank is also 50 years old. 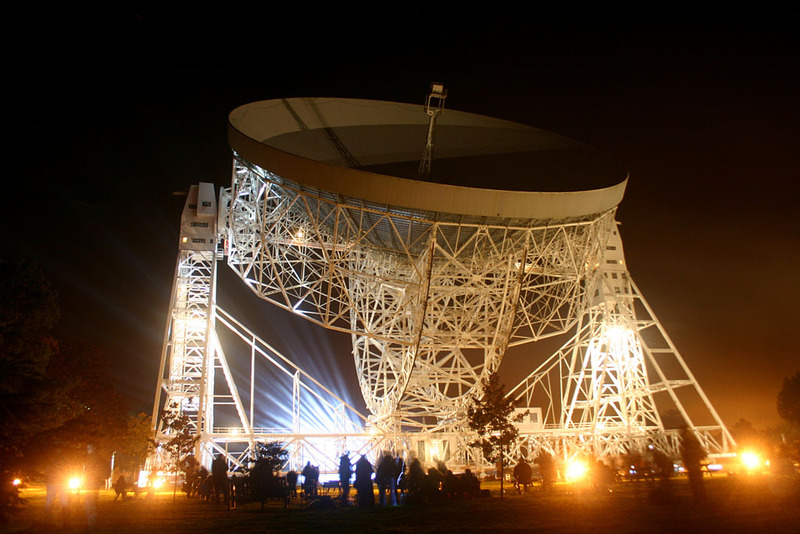 What better way to celebrate the birthday than to visit the site of the 250ft dish and watch an audio-visual presentation that is out of this world – literally. On the evening of 6th October 2007, Adrian Brown and I travelled from Derby over to the famous radio telescope on the Cheshire Plain and prepared for what turned out to be an incredible evening of space images, light displays and music all shown on the largest projector screen in the world – the dish of the telescope. It is the first time that I have seen the Jodrell Bank instrument in any position other than pointing straight up, and being stood next to it showed what a fantastic icon it is. The show started at 20:30 with the lights around the visitor centre being extinguished. The scope started to move slowly from its rest position of vertical to horizontal in a north south line. The motors were incredibly quiet - in fact the only real noise you could hear was the gentle creek of the huge metal structure as it moved. There was silence in the audience as well, everyone sat amazed, as the structure showing it’s immense size, slowly swung into place. The presentation started with views of the Hubble Space Telescope in orbit around the Earth and then moved on to images taken by the HST. As each image, accompanied by music, was displayed, the viewer was taken on a trip through the images as if in a virtual space ship exploring the outer reaches of the galaxy. As the seamless display continued the structure of the radio telescope was illuminated by lights situated at the bottom of each supporting arm and also the central pivot point of the mount. Then the screen went blank only to explode into a bright white light and then fade again as an image of M1 came into view and continued to expand to fill the 250ft screen and the viewer was then taken through to the centre of the supernova explosion. 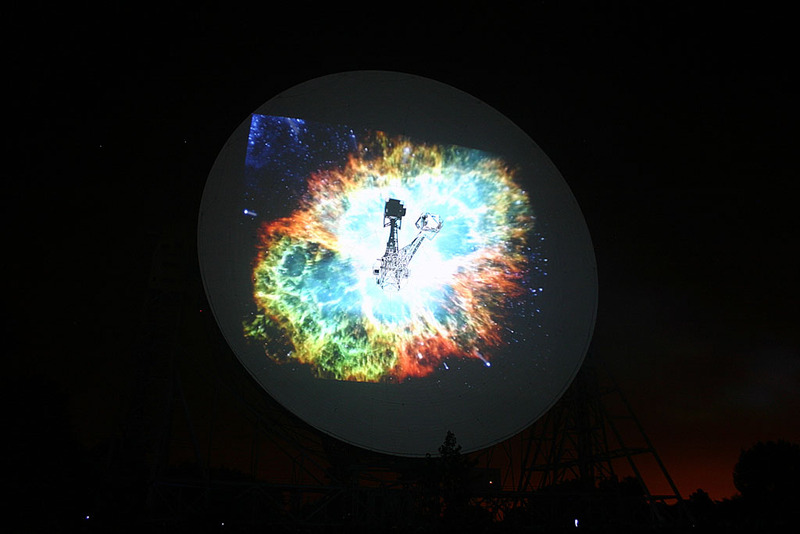 The first half of the show came to a climax and the 'house lights' came up around the dish. A look up to the sky showed that the clouds had moved away and the stars were shining down on the assembled crowd. The Milky Way stretched across the zenith with Pegasus and Andromeda high up in the south, M31 clearly visible with the unaided eye. Over to the east, Auriga was rising, Perseus was higher and the Double Cluster hung in the sky between Perseus and Cassiopeia. Behind the Lovell scope, was Ursa Major, and above it, Ursa Minor. As the house lights went out again, the second half of the show started with the music of Vangelis with a flight through the outer Solar System into planet Earth. The story of the space race and Jodrell Bank then started and archive footage of the building of the sight running in parallel with the advances in the space race took the viewer from the 1950s through to the present day and the formation of the MERLIN network. Included in the archive footage were images of the builders being hoisted high up to the telescope in a huge bucket on the end of a crane - something I think the current Health and Safety Executive would have something to say about! During the second half of the show, the laser show was fired up providing a fantastic light show to compliment the main feature on the enormous screen. Images of the first unmanned missions to the moon and the images produced by Jodrell Bank from those Russian space craft were interspersed by images of manned missions, Gemini and Apollo. All too soon the show was over. But there was an encore. 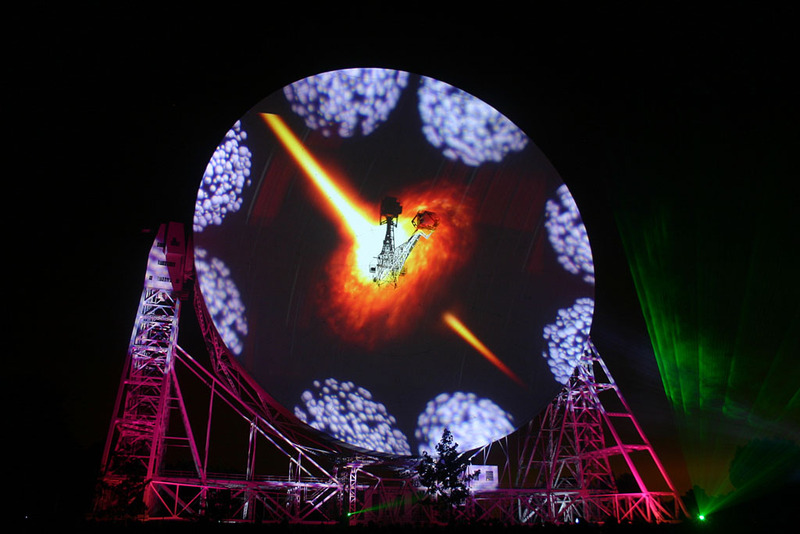 The whole of the second half of the show was replayed and at the end of that, the lights around the Lovell Telescope were illuminated and the gigantic structure slowly pointed in the direction where all it’s work is done, namely the sky. It moved silently upwards with the lasers firing around the base of the mount, coloured lights illuminating the supports, and swirling lights shining on the surface of the dish. And as the dish came to rest, the lights around the site dimmed and went out. And that was it. An absolutely incredible experience and show. I have also made a short video that I compiled from the stills to show a bit of the display and also at the end, the Lovell Telescope slowly moving back to it's rest position of pointing at the sky. Click here to watch the video (3.65 MB Windows Media file). If you have trouble viewing it straight from your browser right click on the link and save it to your hard disk first. As everyone was going, the Lovell Telescope was floodlit and gave me the chance to take one last photo of the results of the vision of Sir Bernard Lovell.